I'm going to start dispensing career advice, whether you like it or not. Why am I qualified? I've long hit the 10,000 Hour mark... The 10,000 Hour Rule holds that 10,000 hours of "deliberate practice" is needed to become world-class in any field. So now I'm going to share a few of the designer career paths I've seen my colleagues take over the years, and some I've taken myself. In this time, I've watched Design transform itself into what it is today – a valued driver of business growth. It wasn't always like this. Remember, at one point designers were LEAVING GOOGLE because Google didn't respect design and designers. With this transformation, new opportunities have emerged for designers of all stripes, and especially those just getting started. Opportunities exist everywhere – Consultancies, startups, ad agencies, corporate inhouse, remote designer working on a beach somewhere in South America. There was a time if you ever went to work in-house at a company, it meant you sucked and couldn't cut it at a real agency. Those days are over. Fortune 100 companies get the value of design now, and are putting the pieces in place for design leadership at all levels. They know they cannot compete in the marketplace without the competitive advantage design brings. When I began to take on more management duties, it was paramount (among many, many other things) to be able to quickly recognize the strengths / weaknesses of staff or freelance designers, to best match them with projects that play to their strengths. It was then I realized how many "flavors" of Designer or Art Director are out there. With all of these career choices available now, recognizing your own strengths, and matching yourself up to the right designer career path will get you where you want to be much more quickly. The below descriptions are generalizations based on my own experience. The bottom line is know your strengths (be honest with yourself), and pick a path that plays to your strengths. You'll progress much more rapidly. You probably had big idea campaign concepts in your portfolio, which is how you got the gig. You might be all ideas, and no design skills. That works here. Or, awesome design chops and an idea machine too! Double your rate. Either way, the big campaign idea is what's valued here, and you'll spend countless hours brainstorming. Got a great idea? Ok, now go flesh it out across Snapchat, TV, landing pages, Virtual Reality, etc. Turn-a-round times for work is lightning fast, weekends and late nights are a given. That being said, you'll gain an enormous amount of experience in a short amount of time. You'll work on recognizable brand names, which will increase your market value. You're shaping the way consumers perceive a brand through marketing campaigns. Alas, there's many ways to shape customer perception, marketing is just one of them. Great products and services delivered digitally is another, which is the domain of another type of designer, but not typically the agency art director. As a UX designer inside of an ad agency, you'll be working on digital marketing properties (Websites, landing pages, mobile apps, digital experience of some sort) in support of a brand campaign. The creative teams new campaign includes a killer mobile app idea! You'll be responsible for figuring out the IA and UX, via sitemaps and wireframes. 9 times out of 10 the creative team has already begun the visual design of the app before you even started wireframing. I've witnessed sites and apps built backwards, forwards and upside down project process-wise. Somehow it all works, mostly. I didn't even know what a consultancy was just a few years ago. Places like Accenture, Deloitte Digital, and small to medium size digital consultancies like the one I work for right now. Projects tend to be "complex enterprise applications" that the public never see's, that live behind firewalls. Business applications that help companies get work done behind the scenes. The digital dashboard that visualizes sensor data from a mining companies heavy machinery in the field. Or the Global Law Firms executive dashboard that at a glance tells the CFO which accounts are 90 days past due. In the past, Enterprise Applications were built exclusively by the engineers, with no designer input. The UX / UI of enterprise applications have traditionally been pretty awful, and it didn't matter, because they had a captive audience (employees) who had no choice but to use it. The times have changed, people expect the software they use at work to function and be as intuitive as the applications they use at home or on their iPhone. There is real work to be done here, on important design challenges that make a difference. Project process is typically more defined here. You'll have exposure to the full landscape of User Experience, such as research, personas, user testing, sitemaps and wireframes. There's opportunities here for visual designers, UX'ers and those in between. Top product design agencies tend to be a blend of world-class visual design and creative work, with super-smart UX. Their design team probably has a visible Dribbble presence. Projects tend to be more consumer-facing, but can run the range from consumer to enterprise. You'll probably work on some well-known brands, or some start-ups who are are just about to break out. Ronin. Han Solo. You're your own boss. Bringing in your own clients, or working onsite at an agency or company to help them on a project-specific basis. What do you call yourself, a consultant or a freelancer? I read somewhere that a freelancersells their time as a temporary fix to a clients problem. Consultants sell their value, with long-term impact and higher rates. You'll of course need to have a killer portfolio if you want to bring in steady work, but you could make more money than a fixed salary. Probably best to work fulltime somewhere to get experience, before striking out into the freelance world. There's one particular designer, Matt Olpinski, who's done a lot of writing around this topic. The dream of opening your own place. I've seen it happen a few different ways. The most common, with the best chances of success, were designers who worked full-time for a few years, then striking out on their own. The talented owners of http://funsize.co Anthony and Natalie come to mind, as does Anton and Irene. Lots of examples of this. Mike Monteiro said 20 years in the field is when designers should start their own firm. I've only seen one instance of someone successfully starting up their own firm straightaway out of college, or not attending design school at all. This is very tough to do, though I'm sure there's success stories I'm not aware of. Nonetheless, the marketplace is very receptive now to small design firms working on their big brands. Companies are smarter now about how they purchase design services, they understand it comes down to the individual talent working on their project. They want to know who exactly is working on their project. Are they any good? They've been burned by large agencies who only put Jr. Designers on their project in order to ensure profitability. Lastly, as a designer, the UX / UI world is not your only avenue to designer career path fulfillment. I've seen career paths for designers go in a thousand creative directions. And in a career that may last 30+ years, be open to changing industries or career focus to ensure long-term relevance. Art Director in an Ad Agency? Make that switch to UX. Copywriter still writing direct mail? Go take a content strategy course. Alan Ball, the screenwriter of the film American Beauty was working as a graphic designer at Adweek when the idea for the film hit him. A classmate of mine from design school later went on to become an iron chef. The point is to keep an open mind, be open to where life takes you and don't get tunnel vision on what you *think* you should be doing. 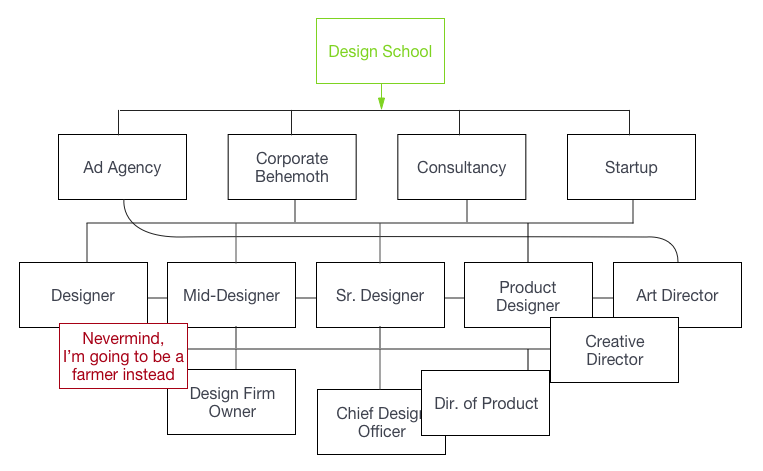 Designer Career paths are long, and can take you in a lot of surprising, interesting directions, if you're open to it. One of my favorite quotes is "if you want to hear god laugh, tell him your plans." Rick Cornett is the UX Lead at a product consultancy here in NYC. His design work has won awards for clients such as Barilla Pasta, Chase Bank, Casio Electronics, and M&M’s. Most recently, his design work was voted one of the 10 best Intranets of 2016 by Nielsen Norman Group.